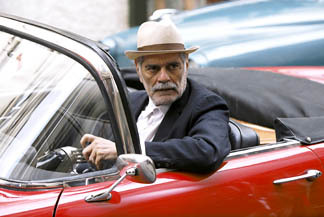 Omar Sharif as the grey-haired, hunched up Monsieur Ibrahim is a stark reminder that everyone ages. Best known for his work in Lawrence of Arabia, Dr. Zhivago and Funny Girl, putting aside the notion of Sharif as an epic movie star is imperative for the believability of Sharif as a poor French convenience store owner. Monsieur Ibrahim is really Moise's story. Moise (Pierre Boulanger), but called Momo, is a young Jewish boy living alone in poverty with his bitter father after his mother abandons them. They live in a ratty apartment in a rough part of Paris in the '60s, and it is Momo's job to keep up the place. Momo's adult responsibilities  making meals and cleaning house  do nothing to stifle his adolescent sexual curiosity. His one splurge is on the benevolent prostitutes that live across the road from him. When money gets tight, he pockets groceries from the store on the street run by "the Arab." Monsieur Ibrahim (Omar Sharif), an elder Muslim man, insists to Momo one day that he "is not an Arab" and initiates an unlikely friendship between the two.